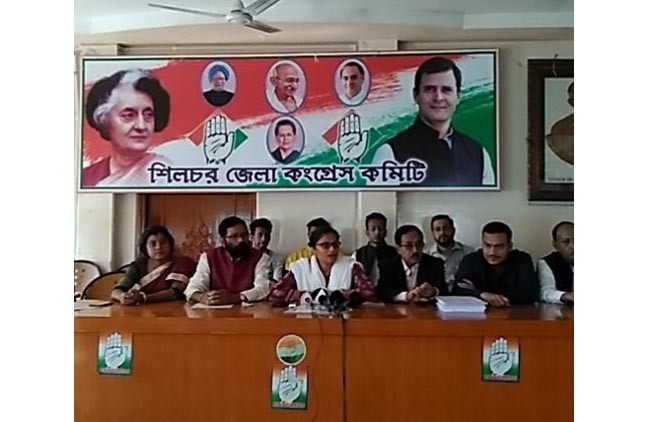 MP from Silchar and All India Mahila Congress Committee president, Susmita Dev, came down heavily on the BJP leaders, especially, state BJP president, Ranjit Das, who in his election campaign disclosed such facts about Sushmita Dev which can prevent her from ever returning to Barak valley. Names of schemes have changed like Indira Awas Yojana has become Pradhan Mantri Awas Yojana, Rastriya Gramin Vidyutikaran Yojana has become Deen Dayal Upadhaya Gramin Vidyutikaran Yojana, but no work has being done, so far. Foundation stones have been laid, work has not started, or is lying, incomplete. The people of Assam would vote in favour of the Congress as both AGP and BJP are two parties of a ‘circus’. Congress MLA from Lakhipur, Rajdeep Goala, too, placed a plethora of questions before the Chief Minister of Assam, and immediate answers too from him, as he is visiting Lakhipur on Wednesday next to address an election rally. “The Chairman of JPC, Rajendra Agarwal, gave me 20 minutes to speak during our last meeting at Delhi, while, giving others just five minutes each. I asked him as to why he allowed me so much of time, to which he said that since I am the only one from my party in favour of this bill, should get more time to speak with alacrity”, said Sushmita.